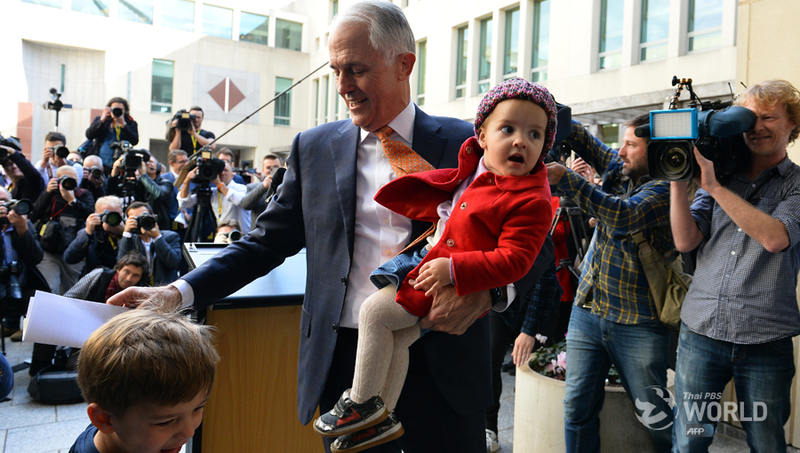 Australia’s incumbent Prime Minister Malcolm Turnbull leaves a press conference with his grandchildren after a party meeting in Canberra today during which Treasurer Scott Morrison was voted as Australia’s seventh prime minister in 11 years. CANBERRA (Reuters) – Australian Treasurer Scott Morrison will become Australia’s new prime minister after winning a Liberal party leadership vote today, ending an internecine battle that has scarred the conservative government ahead of an election due by May 2019. Morrison, who will be Australia’s sixth prime minister in less than 10 years, emerged victorious from a three-way race with former home affairs minister Peter Dutton and Foreign Minister Julie Bishop. Incumbent Prime Minister Malcolm Turnbull, who called the leadership meeting after losing the majority support of the party, opted not to contest the vote. Turnbull told reporters after the vote he would leave parliament “not before too long”. Turnbull’s decision to leave parliament means the new government will face a by-election for his Sydney seat that could see it lose its one-seat majority. Australian media reported that foreign minister Bishop, having been defeated in the leadership ballot, would also likely resign from politics.